Small pleasure #2: I took a super long walk this afternoon. 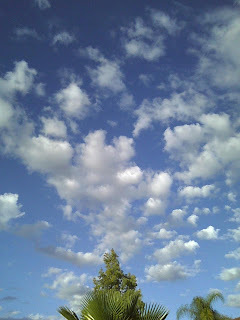 The sky was beautiful bright blue and filled with little cotton ball clouds. Wanna see? Small pleasure #3: Writing this blog entry knowing that I have a great family and group of cyber & real world pals sharing this incredible journey with me. I thank you from the bottom of my heart. Yummy, Michelle. I loved banana splits in my old life. I'm definitely trying this when warm weather is here again. I'm too cold for ice cream at the moment. Fall is here in Tennessee. I haven't written you in a while, been in the hospital ect. Just wanted to tell you that your blog means so much to me. It is the cherry on my sundae. PLease know that people are affected by your kindness and words. Thank you.